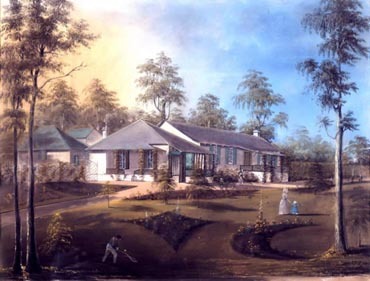 La Trobe's Cottage was the home of Charles Joseph La Trobe, Victoria's first governor, and his wife Sophie and their children from 1839 to 1854. Originally erected on his Jolimont estate, the single storey dwelling is constructed of panellised timber, replicating the original prefabricated structure brought by him from London. The locally built dining room (1839), the first of many additions made during La Trobe's tenure, is the oldest surviving Melbourne building. The modest yet elegant family home contains many pieces of La Trobe’s furniture and other historic artefacts. Charles Joseph La Trobe was appointed as the Superintendent of the Port Philip district of New South Wales and arrived with his Swiss wife Sophie and their two-year-old daughter Agnes on 3 October 1839. La Trobe had been advised that there would be no official residence provided for him and he brought with him from London a prefabricated house built by Manning of London. There was a considerable industry in prefabricated houses at the time as many new colonies were being settled. La Trobe brought a panelled cottage consisting of two main rooms. It was erected on a corner of the ‘Government Paddock’; La Trobe engaged a local builder, George Beaver, to add a dining room to the cottage when it was first erected in 1839. 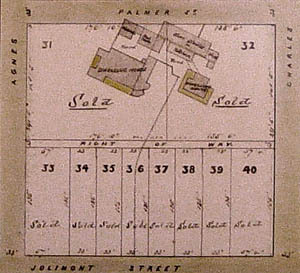 La Trobe was given permission to bid for and buy the twelve and a half acres on which it stood at a public auction on 10 June 1840. He named his estate ‘Jolimont’, later the name of the suburb adjacent to the Melbourne Cricket Ground. The portable cottage became only the nucleus of the dwelling – La Trobe extended as the needs of his growing family expanded. He added a kitchen and servants’ quarters at the rear, built two nurseries for the children, extended the rear of the cottage, added a library in front of the dining room, and constructed extensive stables at the rear. He moved his holiday cottage from Shortland's Bluff (later named Queenscliff) and re-erected it to the east of the Cottage to provide a school room and servants’ and visitor accommodation. Further east was ’Upper Jolimont’, a framed prefabricated house which he originally intended to be his residence. By the time it arrived, his family were well settled into the smaller panelled cottage, so he erected the framed house in the north east corner of the estate. He subsequently rented it out; two of the better known tenants being Bishop Perry and the Auditor-General Hugh Childers. The grounds of ‘Jolimont’ had the appearance of a country estate with a long carriage drive from the main entrance on the north boundary past the grotto and shrubberies to the west of the cottage. To the south of the cottage were extensive paths and a rockery, while on the east side there were parterres with a kitchen garden beyond. La Trobe was promoted to Lieutenant-Governor of the new colony of Victoria in 1851. He continued to live at Jolimont until he returned to England in 1854. 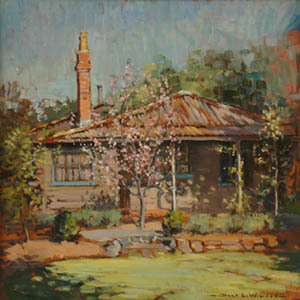 After La Trobe’s departure, the cottages at Jolimont were initially rented out, under the supervision of his Melbourne agent, James Graham. The land was subsequently subdivided and sold. By the late 1880s a large warehouse had been built alongside the front of the Cottage and this was bought by Bedggood & Co., Shoe Manufacturers, in 1899. In 1931 they commissioned Edna Walling, the eminent landscape designer, to create a garden in front of the dining room. The Cottage was at that time opened to the public and tours were taken, by arrangement, with a member of the Bedggood family acting as a guide for visitors. The factory expanded in 1937 and in the process demolished all but the dining room and parts of the drawing room. By the 1950s it looked as if the entire Cottage might be lost. The National Trust then acquired the building and in 1963 - after a suitable site had been found and considerable research into the details of the original cottage had been carried out - moved it to land near the Royal Botanic Gardens Herbarium. A reconstruction of the original prefabricated cottage was added to the surviving authentic sections; items such as the original bedroom fireplace and front door lock and knocker were found and reinstated and a number of original furnishings and artefacts obtained. The project of removal and reconstruction was managed on an honorary basis by heritage architects Phyllis and John Murphy. The Cottage was moved again to its present site in 1998. This was brought about by the Royal Botanic Gardens needing the land to develop The Ian Potter Foundation Children’s Garden. National Trust citation, Heritage Victoria citation. Miles Lewis, La Trobe’s Cottage: a Conservation Analysis. Miles Lewis, 'Jolimont in Context', La Trobeana, 9 (1). 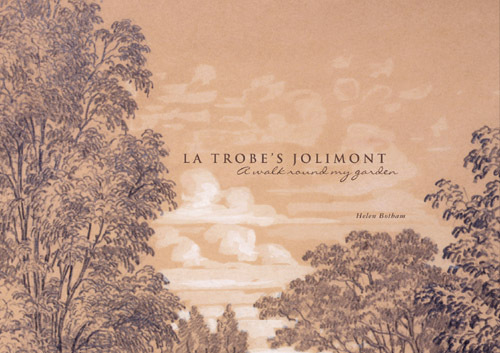 La Trobe’s Jolimont: a walk round my garden takes the reader on a tour of the garden using twenty-two detailed drawings by Edward La Trobe Bateman completed in 1853. The drawings, plotted on an 1853 survey of the estate, and extracts from letters La Trobe wrote to his daughter describing his house give us a flavour of the little every-day matters of life at Jolimont in its hey-day. These pictures were drawn by La Trobe's cousin, Edward La Trobe Bateman in 1853. Dora Wilson. Governor La Trobe's House, Jolimont, c.1934.